As they say in the movies, we met cute. My husband and I were flying home from a trip to San Diego, sitting across the aisle from each other the way we do. We had flown down to take his Aunt Bette to lunch to celebrate her 80th birthday. It’s the only way I can figure out the year I met Martha–2003. The plane was crowded, and the middle seat to my right was taken up by a small, pleasant, gray-haired lady. During the flight I took out several pages of a manuscript that I had promised to look at for a friend. The work was dreadful and I’m sure I groaned and sighed as I slashed away at it with a pen. “But are you a writer?” she asked. Well, I fancied myself to be a writer, since at that time I’d had a few things published in the San Francisco Chronicle and other places. “I’m a writer too,” she said. At the time, she was well into her 80’s. It turns out she’d grown up in Berkeley, graduated from Berkeley High, and then from Cal around the same time as my father-in-law, in1941. She’d written a couple of books and had a regular column in the Modesto Bee called “Our Turn.” I’m sitting here with a copy of her collected writing from that time called My Turn: A Grandmother’s Legacy of Words. We compared notes on our publications, exchanged emails and business cards and agreed to stay in touch. And we did. I’ve just been checking through my old emails, and my, didn’t we have a lively correspondence over the years! I wrote to her about my daughter’s first pregnancy. “You’re much too young to be a grandmother!” she wrote. We shared many joys –both personal and professional–and shared family photos as well. She sent me links to things she thought I’d be interested in and I did the same for her. I also wrote to her about the deaths of my father-in-law and my mother within a few months of each other. I told her about weddings, graduations, births, and other life events that you share with your friends. She wrote back congratulations, condolences, mazel tovs and encouragements, and filled me in on her many travels and visits with family. She didn’t sit still much, except to write. And she wrote a lot. She began teaching a class to “seniors” on memoir writing, and we exchanged ideas for her students to try. I sent her something I’d written, based on a poem, and she immediately borrowed the idea for her class. In her second collection of essays from the Bee, she also included some advice for a new mom I’d asked her to contribute as part of a little book I put together for my daughter. 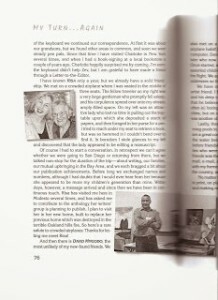 There’s a picture of me holding my newborn granddaughter accompanying the piece in Martha’s book. Even though I am the same age as her two sons, Martha and I were more like girlfriends who share a love of family, a good story, and writing. Reading over those old emails, I can feel the love and support she never failed to include. “We write about the same things!” she told me once, when I sent her a piece about my dad. I felt the same way about her writing. I drove to Modesto to see her number of times. She showed me her home office, and took me to lunch. She insisted on driving and paying, every time. Wouldn’t hear of my picking up the tab or chauffeuring her around. But sometime last year, I noticed that our email correspondence had lapsed. I sent her a couple of short “how are you?” notes and didn’t hear back. I called her house and got a weird voicemail message. I tracked down one of her sons and spoke with him. He asked me a few questions (we’d never met and I wasn’t sure he knew who I was: a friend of his mom’s) and then he told me that she had begun showing signs of dementia. I mentioned my latest emails, and he told me, sadly, that she wasn’t on her computer anymore. I asked if it was OK to call. He said he thought if I identified myself a few times, she would possibly remember me. So I did call. It took a while, but after repeating the airplane story, I could hear the old excitement in her voice. “How’s the family?” she asked. And asked again moments later. It was a short conversation, but I felt that we connected in some way. She sounded like her cheerful self on the phone, if a bit confused. Martha and I both have November birthdays, one week apart. I always think of her, and what she meant to me around this time. Just this morning, I started to write again to her son. I was aghast to see that it had been almost a year since I spoke with him and then talked to Martha. But before I hit “send” with my gentle inquiry about his mother, I typed her name into a new search box. Martha’s father had lived past 100, after all. And that’s how I learned she’d passed away last December. I am so sad today. But I am so lucky to have had dear Martha in my life for as long as I did. She continues to inspire me every day. You were so blessed to have Martha in your life, Risa. I just love this story. But since I hate change I was so sorry to hear of her passing. I’m glad you are celebrating her, and your friendship, each year. It’s very special to keep our loves one near us. That is why I offered that poem today from Emily Dickinson. My beloved uncle passed away 2 years ago from stupid pancreatic cancer. It was a huge loss, especially to my dad, his best friend. Two brothers.. Thank for this, Risa. I won’t easily forget it. 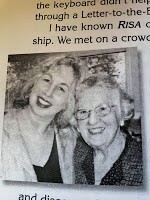 RIsa: My cousin Nancy Rubin just sent me your column about my mom. I’m Martha’s other twin son, the one who lives in Michigan. I was thinking about my Mom and what would have been her birthday 99th today…so it was very special when Nancy forwarded your column to me. I volunteer at the day program of our local branch of the Alzheimer’s Association, and I often read from my Mom’s books to the ladies there. In every picture I have of my Mom, she’s smiling. One of the nicest things in our house is a handwritten note from my Mom that she sent me on a Father’s Day; she wrote “my memories are all good ones, and I hope that yours are too.” Thanks so much for what you wrote, and for being such a good friend to my Mom! May all of your memories be good ones too. So nice to hear from you. I love hearing this about your mom. She was such a positive influence as well as an inspiration. Thank you for writing and sharing a touching story about your mom. I’m sure the ladies enjoy hearing her stories when you read to them. Such a sweet article. I felt sad when I read this because I thought of my mom again, but also happy because she had such a good friend. I know she greatly valued your friendship, Risa. Thanks, Mike. I valued her friendship too–more than she knew, I think. Thanks for writing.